Sometimes you just want an easy trip. You know, the type that’s usually on the short side and doesn’t require much of an agenda. For most travelers, a classic beach-style vacation is what comes to mind. 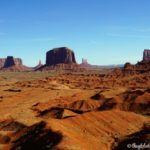 In truth, it could be any destination where you don’t need maps or guidebooks. There’s no plan to seek out the “best” restaurants. Nor are you expecting life-changing discoveries. The only goal each day is to wake up, smile, and enjoy the day. Seriously. Thanks, Southwest! We can land now. Playa del Carmen is between Cancun and Tulum and a short ferry ride to Cozumel. It’s become super popular very quickly and it’s easy to see why. 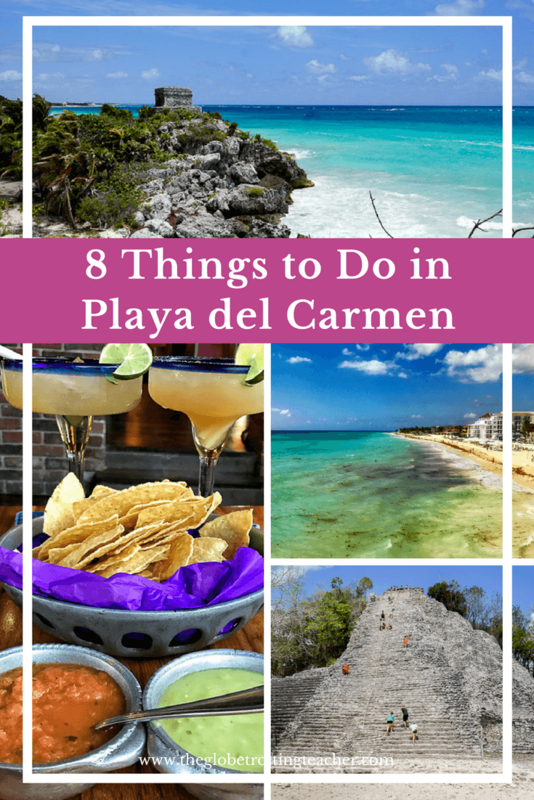 There are so many things to do in Playa del Carmen! The area has beautiful beaches, water sports, Mayan ruins, adventure parks, and a pedestrian-friendly avenue for shopping and dining. The great part is what to do in Playa del Carmen is totally up to you. 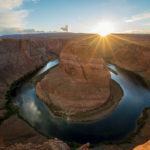 Be as adventurous or as nonactive as you want to be. 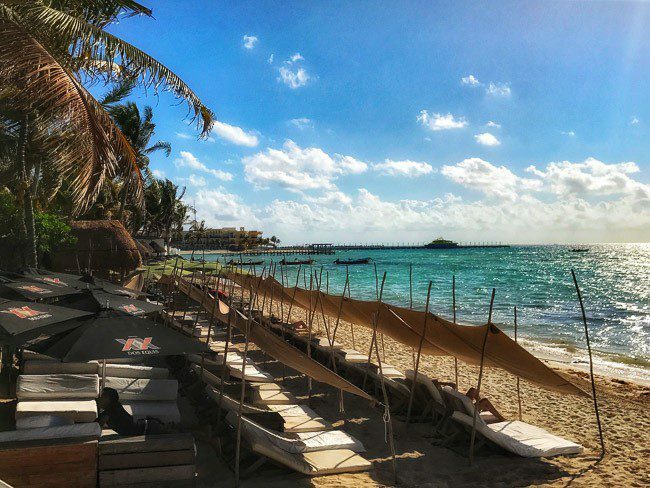 Either way, Playa del Carmen makes for a perfect Yucatan base. 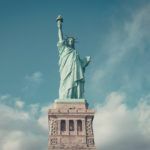 Pin this post to your Pinterest travel board. 1. Relax at a Playa del Carmen beach. 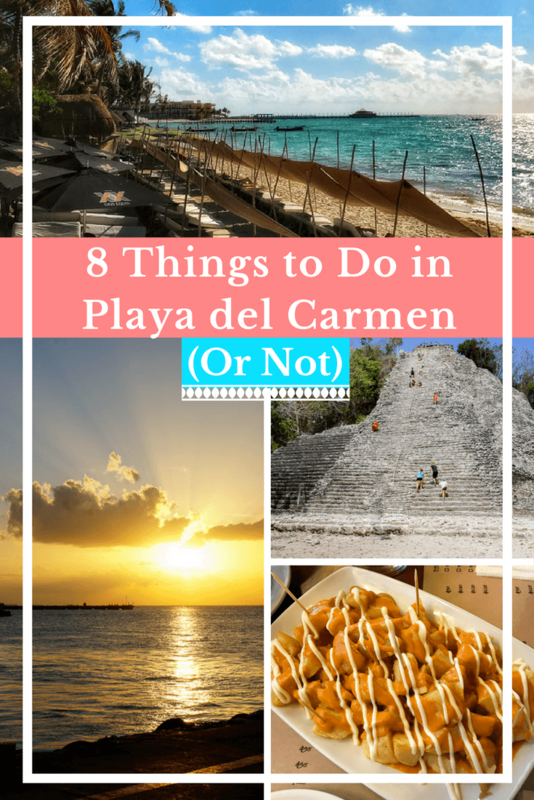 Topping the list of Playa del Carmen things to do? The beach, of course! Whether you prefer a quieter spot like Playacar or the main stretches of beach lined with beach clubs, there’s no shortage of sand and sea. All beaches in Playa del Carmen are public which is different than Cancun where many beach-fronts are for resort guests only. I’m hardly a beach connoisseur but the best beach in Playa del Carmen is in the Playacar area. These beaches are quieter, with wider stretches of pristine sand. On the other hand, the beach clubs closer to town offer lounge chairs, umbrellas, and waiter service with food and drinks for order. It all depends on the vibe you want. Waiter service on the beach is…awesome. 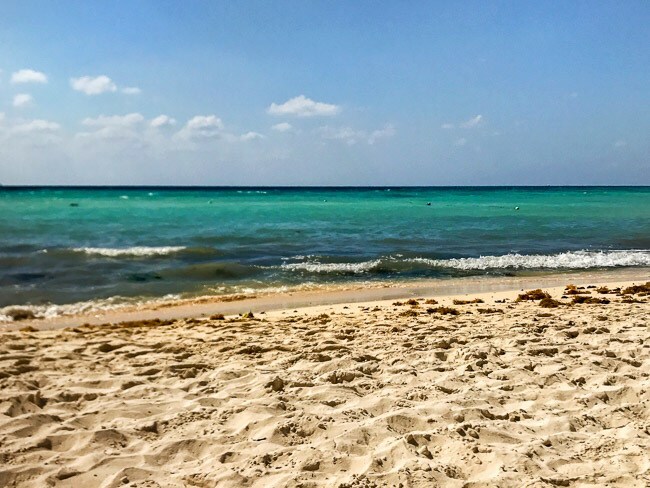 If you venture away from the hustle of Playa, the beaches of Akumal and Tulum are easy to reach and on the quieter side. 2. Get active with Playa del Carmen Excursions in the water. Is there an adventurous pull taking you out of your lounge chair? If getting out on, in, or above the water to play is your thing, there’s enough to satisfy you for days. Jet skiing, boating, parasailing, scuba diving, snorkeling…take your pick! Equipment is available for rent along the beach and 5th Avenue. 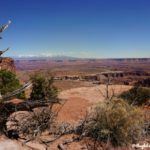 Guided day tours are just as easily booked. 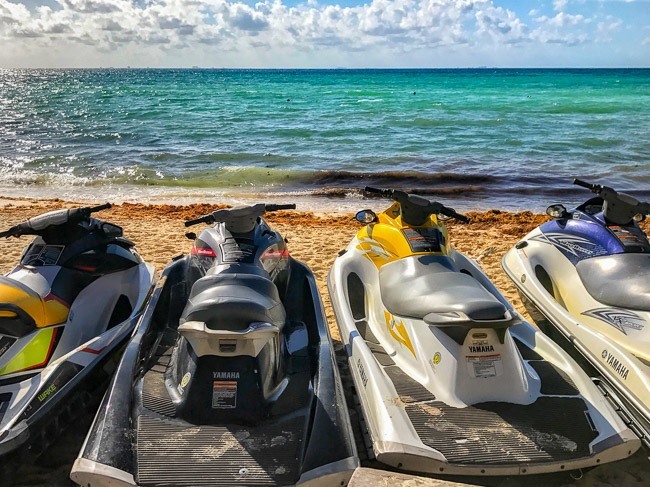 The jet skis are ready to go! 3. Do some Cozumel Snorkeling. One of the more unique things to do in Playa del Carmen is to take the ferry to Cozumel. 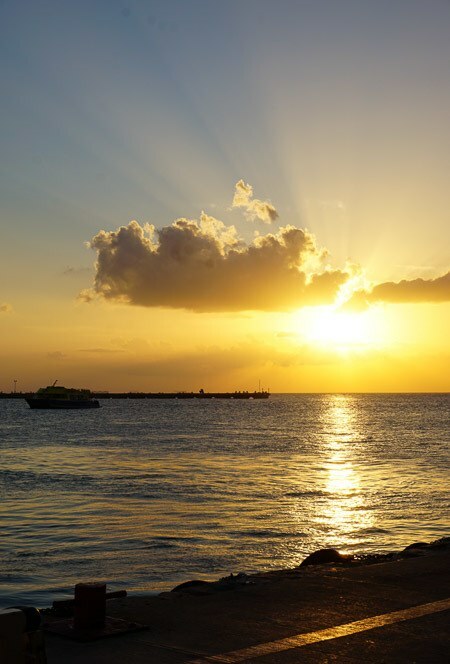 Ferries run directly from the piers in Playa del Carmen to Cozumel. If your hotel is in walking distance to the beach, the ferries are in walking distance, too. Several companies sell tickets along the 5th Avenue pedestrian zone. Mexico Waterjets was the best price I found at 75 MX per person ($4USD), but be sure to shop around for the best price. The ride lasts about 35 minutes and day tours and vehicle rentals are available to book before, on, and after the ferry. Snorkel and lounge for a carefree day on Cozumel. I highly recommend renting a Vespa to have the freedom to explore the island’s beaches. Snorkeling is one of the best things to do in Cozumel. Having a Vespa or another rented vehicle will allow you to snorkel at different spots at your own pace. Snorkel gear is easily rented or can be cheaply purchased in Playa del Carmen if you plan on snorkeling a lot. The best snorkeling in Cozumel is the Palancar reef. Make your way to Playa Palancar and for Cozumel snorkeling tours out to the reef. The Mayans were the Yucatan’s first inhabitants before being conquered by Spanish explorers. 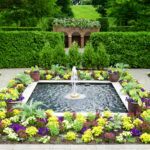 Their presence and influence are rooted in the region’s culture, food, beliefs, and architecture. Luckily, ruins from Mayan civilizations past survive and can be visited today. Chichen Itza is a full day trip away from Playa and is arguably the most well-known and best Mayan ruins in Mexico. 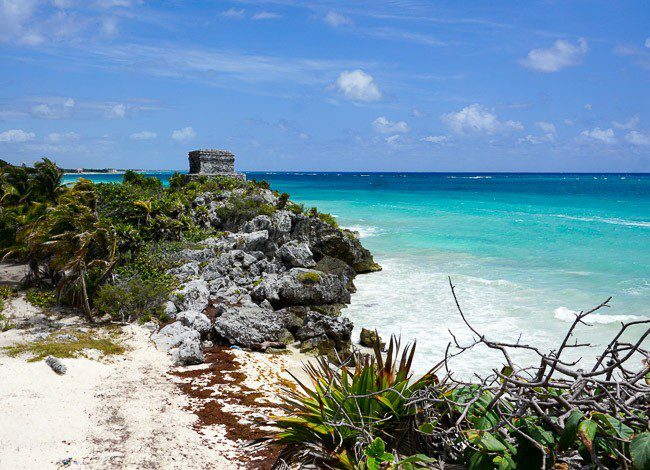 The Tulum Mayan Ruins are just an hour from Playa del Carmen. They’re a stunning display of ancient structures set against the turquoise blue ocean waters. Colectivos, or local buses, run from Playa to the Tulum ruins. You can also join a Tulum ruins tour. But, you’re best off renting a car, even for the day, if you’re interested in visiting a nearby cenote or other ruins. Tulum’s ruins get crowded as the day goes on so go earlier in the morning if you can. Make your way through the theme park-like maze of shops and vendors to the entrance of the archaeological zone to buy a ticket for 70MX per person ($3.75 USD). The ruins complex is well-kept and simply gorgeous. Signs are in Spanish and English. You can also book a guide beforehand to go deeper into the history on your visit. By car from Tulum, you can also visit the lesser known (but rising in interest) Coba Mayan ruins. Coba is a vast complex of former Mayan pathways, roads, and ceremonial structures. 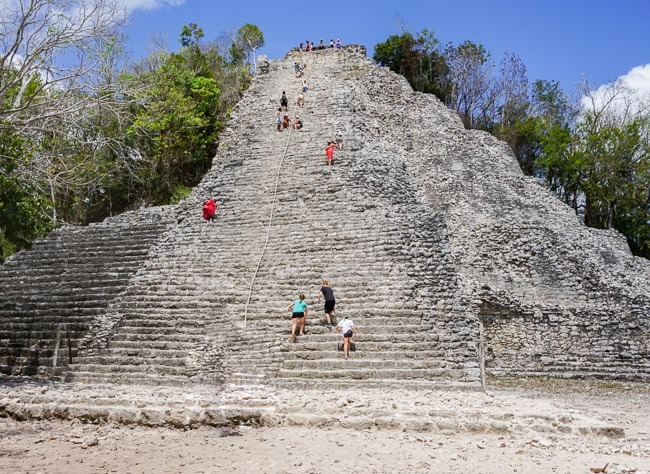 Nohoch Mul Pyramid is the tallest temple, and as of March 2017, could still be climbed via the 120+ steep, uneven steps. 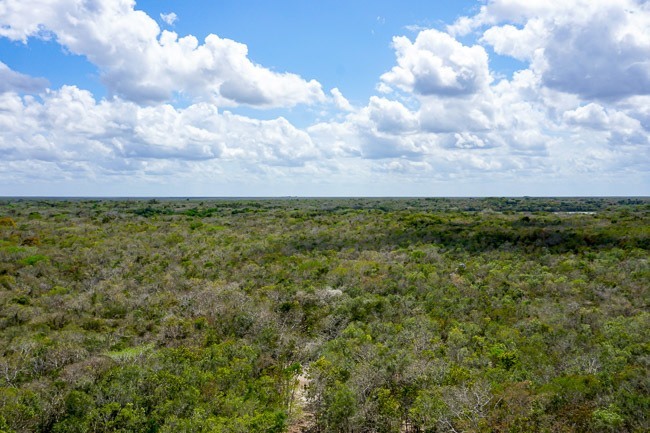 The view overlooks the dense, green Yucatan jungle and makes you wonder what the Mayans thought as they gazed upon similar views. The Coba Archaeological Park charges 70 MX per person. Bikes and bike taxis are available to rent. I recommend taking advantage of this as the distance is long from the entrance to the main temple. Our taxi driver even shared his knowledge of the ruins along the way and the surrounding jungle. 5. 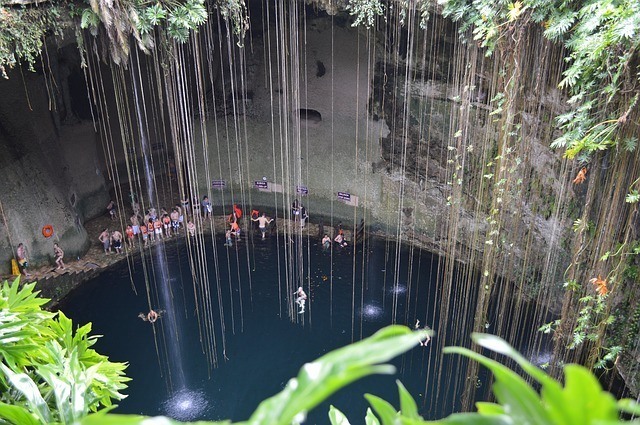 Go for a Cenote swim. Go early to avoid crowds. These natural sinkholes and caves are all over the Yucatan Peninsula and reveal pure groundwater underneath. The Mayans thought of them as sacred and used them for ceremonial rituals. Today, they’re popular for snorkeling, swimming, free jumping (where permitted), and scuba diving. Cenote Azul, Jardin del Eden, and Cristalino are cenotes near Playa del Carmen, while Gran Cenote and Cenote Ik Kil are among the most popular. 6. 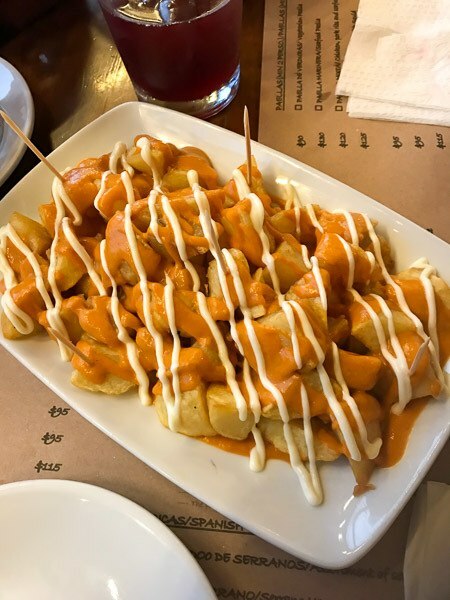 Eat papas bravas and paella at the restaurants in Playa del Carmen. And wash it all down with margaritas because everyone knows the tequila burns off all the calories. 😉 Of all the Playa del Carmen restaurants we tried, we really loved El Tapas & Company on Calle 10 Norte between 15th and 20th Avenues. 7. Visit a Playa del Carmen adventure park. Hoping to zip line or swim in underground rivers? 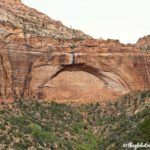 How about spelunking or rafting? Xplor is just outside of Playa and has a day packed with one thrill after another. Not to be confused with Xcaret, which if you’re an animal lover, should be avoided. See below about captive dolphins. Rio Secreto is only accessed with a guide. Explore dark caves as you wade through underground pools of water. Go for the adventure and be amazed by the intricately formed stalactites. 8. Shop, eat and be merry on 5th Avenue Playa del Carmen. After you’ve spent the day at the beach, in the water, or exploring ancient ruins, stroll along 5th Avenue for some people-watching and shopping in Playa del Carmen. Hundreds of shops, restaurants, bars, and clubs line this pedestrian zone. 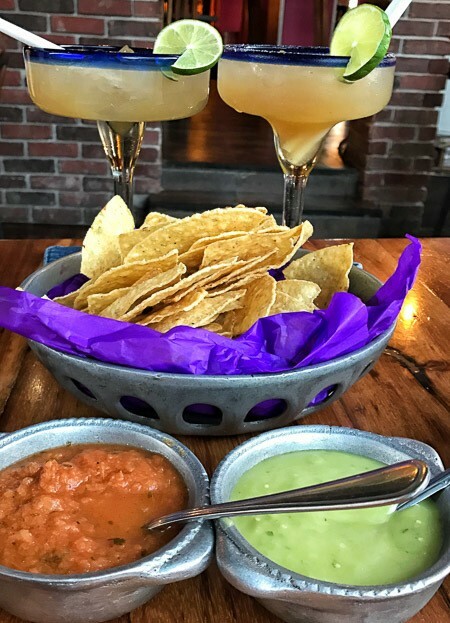 Whether you’re looking for a family-friendly place to eat, local clothing, mini-sombreros for your dog (really! ), or a swanky bar or nightclub, you’ll find it on 5th Avenue. Yes, it’s totally touristy, but it still makes for a fun night out in Playa. 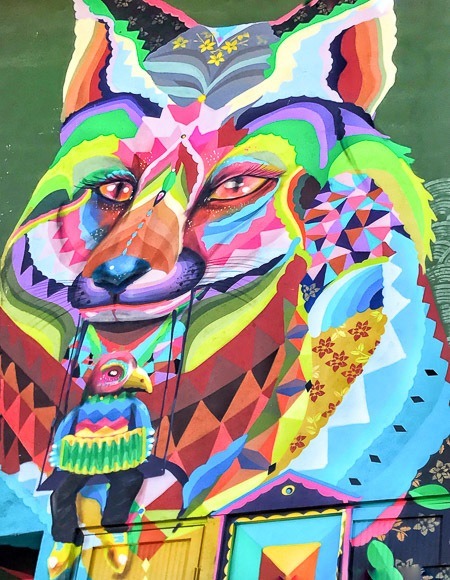 Which Playa del Carmen Attractions Didn’t Make the List? Regardless of whether you want to relax on the beach or jet ski your days away, here are 3 wild animal experiences to keep off your Playa to-do list. Visitors can no longer swim with the wild turtles at Akumal. New regulations prohibit this because tourists were disturbing the turtles and their habitat. 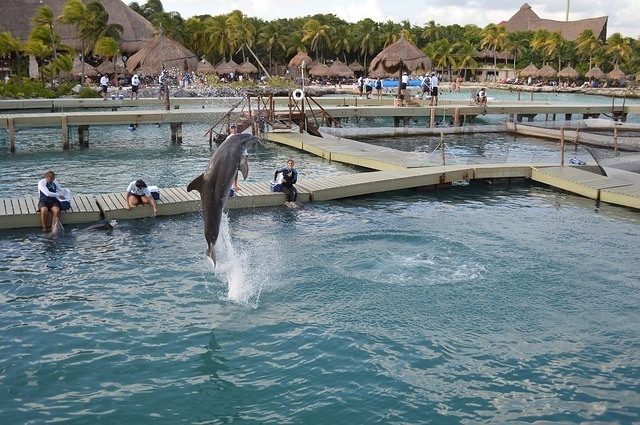 Xcaret is not recommended, and neither is the Chankanaab National Park in Cozumel because they offer swimming with the dolphins excursions. Travel Responsibly. Don’t support attractions with captive dolphins. 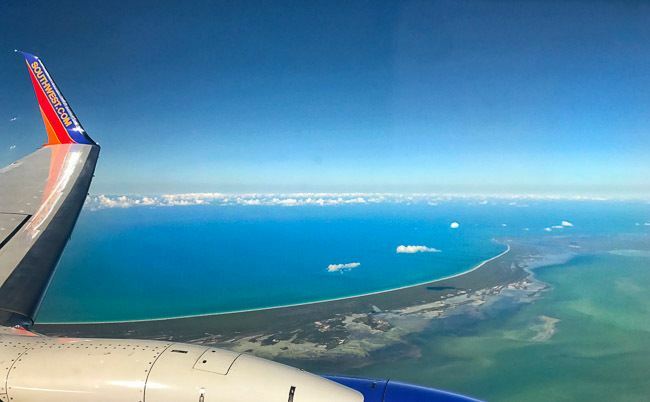 Flights to Playa del Carmen arrive into the closest major airport, Cancun International about an hour’s drive away. Arrange transportation to your hotel before arrival, take a standard taxi with a fixed rate, rent a car, or take the ADO bus from the airport to Playa del Carmen. We took the ADO bus. It was easy and cheap. Purchase your tickets at the airport just after getting your luggage and passing through border control and customs. A single one-way ticket costs 178 MX or about $10 USD. The bus leaves you in Playa along 5th Avenue where you can walk or take a local taxi to your accommodation. 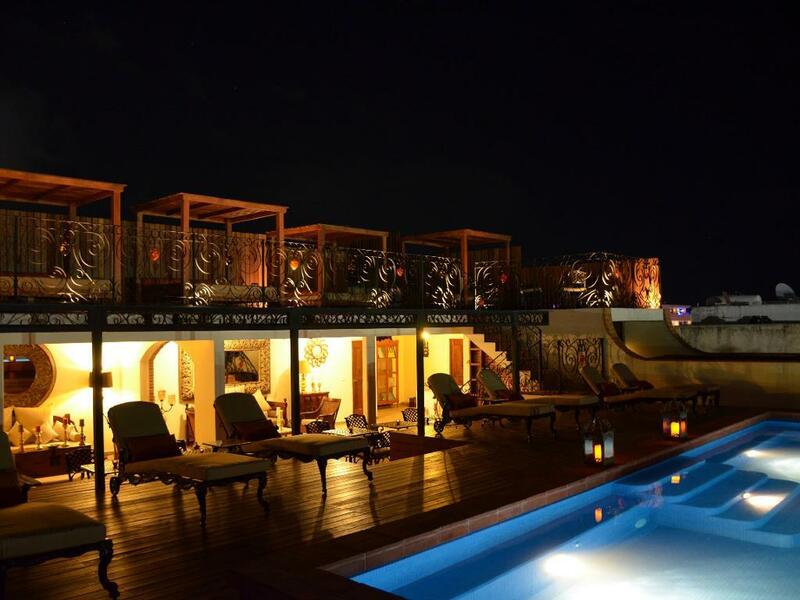 I used cashback rewards to pay for a stay at La Pasion Boutique Hotel by Bunik. The hotel has pretty grounds which includes a rooftop pool, a bar, and a lounge area. 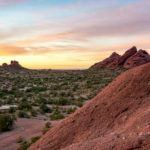 The staff was very friendly and the rooms comfortable with great AC. Free water and breakfast were included in the rate. The hotel is just 3-4 blocks from the beach and 5th Avenue. We were close enough to everything but could sleep peacefully at night. There was also a Walmart just a couple blocks from the hotel, as well as the bus station for our return trip to the airport. Check latest prices in Playa del Carmen or Book Now. The beach, 5th Avenue, and many of the main tourist areas are entirely walkable. For points further off in town, taxis are widely available. There should be flat rates between 25-100 MX for downtown and in town destinations, so agree to a price before getting in the car. Renting a car will give you the freedom to explore and avoid bigger bus tours. You can easily rent a car for as short as a day or for the length of your trip depending on your plans. Driving is easy between Playa and its nearby cities and attractions. The main roads are paved and well-marked. You will need pesos or US dollars at gas stations. Colectivos are small, local taxi vans that can drop you off any place along their route for no more than $2. Check with your hotel about where the van you need leaves from in Playa. What an amazing place. Apart from the fantastic beaches, I would love to see the Mayan Ruins and the cenotes. Definitely on my bucket list. Yeah, love the Southwest Companion Pass!!! Great suggestions, we like doing a beach and ruin combo – a little hike in the am followed by a swim to cool down. We were in Playa del Carmen recently, on a night out during our stay on the Riviera Maya. I’d have loved to have time to see Cozumel but we did at least make it to Tulum. Thankfully it was the morning but still super busy! Nice! I’m glad you made it to Tulum, Suze. It’s so pretty. 🙂 Cozumel was a great day excursion. Great rundown on Playa del Carmen. I too like going to an “easy” location every once and a while, and just relax by the pool or on a beach. I’ve heard great things about Playa del Carmen too, and I think it is a little more my speed than Cancun. I love that you can explore the nearby Mayan ruins and the natural sinkholes as well! Oh man. I get totally envious every time you mention that southwestern pass. I really wish easyJet or Ryanair would introduce something like that! It’s really such an amazing perk, Anne! I just wish it never expired! Jackie, thats a comprehensive list of things to do and enjoy in Playa del Carmen. Food looks appetizing enough for me to include it in my list for Mexico. Even the weather seems lovely..
Definitely worth your time, Nisha. Playa’s just fun and easy and a good hop off to other points on the Yucatan. I would definitely be spending time on the beach! I love “lazy” vacations, although I do love history so I’d probably spend some time exploring the Mayan ruins as well. And I’m so glad to hear they stopped allowing swimming with turtles. It seems like a cool experience, but only if its done responsibly and it is affecting the wildlife. I’m with you, Vicky. I wanted to check out the turtles but once I heard about habitat destruction and too many turtle selfies I was glad they banned it, too. Same here, Meg. A little bit of adventure and relaxation is the key for me, too. 🙂 Now that I’ve been to both Cancun and Playa, I’d definitely choose to base myself in Playa. I just loved the vibe. Playa del Carmen is really adorable and I find the beach fascinating but Cenote captures my attention, the place is very unusual. I wish I could Free jumping and snorkelling too, that really sounds awesome. Thanks for reading! The cenotes are such a unique feature of the Yucatan peninsula. Such a fun adventure to explore them! I just came back from there a few days ago. Everything you wrote is correct! The beaches closer to playacar are amazing! I went to Playa Akumal and was able to snorkel. They only required me to rent a life vest. It only cost 150 pesos. I was able to swim with the turtles. I used the Collectivo mostly and it worked out well for me. I visited all the ruins I could in my 8 days there, Coba, Tulum and Chitzen Itza. Well worth it! Saw a family of spider monkey in the jungle canopy when I was at the top of the pyramid in Coba. A beautiful experience. I’m so glad you had a great trip, Olivia! So cool to see a spider monkey at Coba. I’ve only seen them in Costa Rica. Interesting you were able to swim with the turtles at Akumal. I wonder if they’ve made changes to allow tourists to do this while keeping it safe for the turtles. Your information on Akumal is wrong, you can absolutely swim with the wild turtles. For the free option bring your own gear and walk down the beach past the marked off guide areas (just past Secrets) and set up on the beach. There are many turtles to be seen, especially if you go early. Thanks for reading, Alicia, and thanks for the update. When I was there, we absolutely could not swim with the turtles and were turned away by several people. We were told due to tourists disrupting the habitat and even grabbing turtles for selfies, swimming with them was banned, free or otherwise. Hopefully, they’ve figured out a way to balance the turtles’ safety with the visitors’ swimming experience. Glad you enjoyed your swim. Can anyone suggest a ground transportation or driver from Cancun Airport to Playacar II (a house) for myself only for around $30 USD and not ADO since I have a slight disability and walking with luggage is a challenge but not impossible. I don’t mind sharing for up to 3 people. Thanks for reading, Etta. Here’s an option around $30USD. I’d just confirm Playacar II with them. Thanks for the great advise about shoes and love this surfers place. I might want to check it in person (for hubby would be a great gift!). Trying to decide between occidental carer resort (all inclusive) or getting a boutique hotel? 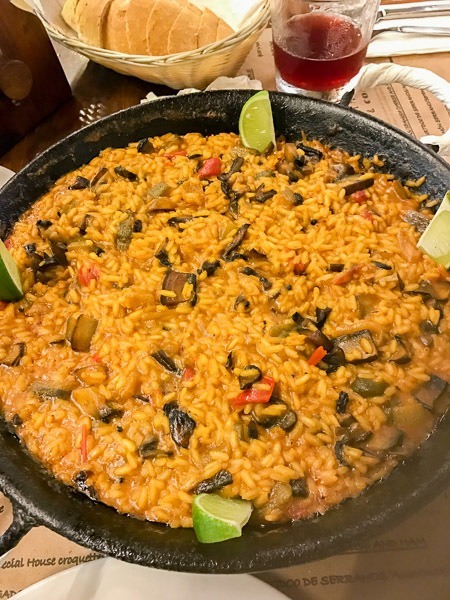 What does the average alcohalic beverage and meal cost in playa? 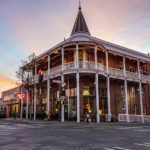 How safe is it to stay at a hotel vs a resort? My interests are the historical part but what would you suggest that is unique for us all ? My husband and I loved Playa so much our last visit down, we bought a condo! It’s under construction, to be completed around October. Can’t wait to spend a lot more time exploring Pkaya and surrounding areas. Thanks for your tips!